100% pure USA alpaca filled pillow, hypoallergenic, naturally fire retardant, and antibacterial. Dimensions: Standard: 19" x 27"; Queen: 19" x 30"; King: 19" x 35"
Weight: Standard: 3-4 lbs. ; Queen: 4-5 lbs. ; King: 5-6 lbs. Pricey yet best pillow my husband ever had. And he’s a poor sleeper. Mary Anderle cares a lot about pillows. She cares about the filling (100% alpaca), the fabric cover (made from viscose bamboo) and even the thread and tags (organic materials). You might not have given a lot of thought to your pillow, but Mary definitely has. An interior designer for more than 25 years, she became inspired to create alpaca pillows after learning about the inherent benefits of alpaca fiber. It’s lofty, inhospitable to dust mites, and it’s naturally fire retardant without the need for chemicals. Alpaca is also great for allergy-prone sleepers. Many people who are sensitive to wool find that they’re not sensitive to alpaca, since their fiber doesn’t contain lanolin, which can hold dust and microscopic allergens. 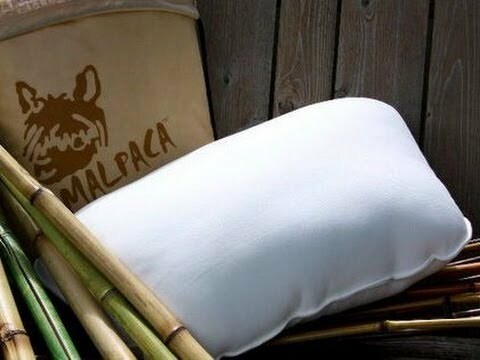 Mary’s Malpaca pillows are hand-sewn and filled entirely with fiber from U.S. alpacas raised in herbicide-free settings. They’re not dipped in pesticide baths, and no chemicals, dyes, or bleaches are used during processing. Maintaining one of Mary’s pillows is as simple as setting it in the sunshine, which cleans and deodorizes the pillow. And did we mention the comfort factor? Utterly luxurious. You’ll feel the difference alpaca makes, every time your head hits the pillow.